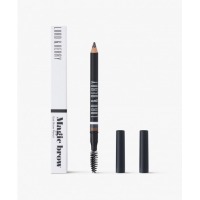 Superb eyebrow pencil with a brush included! The shade consists of 3 hues. Create perfect eyebrows with this pencil! + Swatches and many photos. Hello there! Price : ca. 14.00 Packaging : The pencil came in white paper packaging with a product description written on it. The pencil is available in 3 shades. Pencil: it’s a two-sided pencil that has a brush on the other end. It’s very lightweight and not mechanical.